This course is ideal for teachers who need or would like a basic understanding of life support skills for conditions they may encounter while they care for and look after children during school hours or for after school curricular activities. This course will include subjects like their role and responsibility, managing an emergency situation, casualty care, asthma, allergies, choking, head injuries, primary and secondary care skills and more. This qualification is ideal for teachers, social workers, teaching assistants and club leaders or anyone who needs basic training. All our first aid courses include first aid content that meets the latest UK & European Resuscitation Council Guidelines and the HSE requirements for correct first aid content and practice. 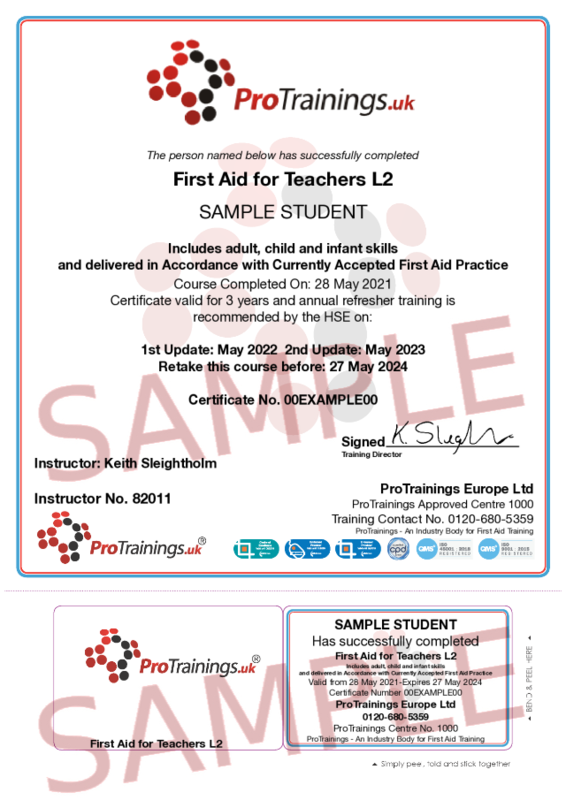 Upon achieving this qualification, all successful students will be awarded a certificate that includes adult, child and infant skills and confirmation that it has been delivered in accordance with currently accepted first aid practice. This course comes with 5.0 hours of CPD, although the time to complete the course online may be less than this.